Okhla Phase-III is not really a Gurgaon or Noida boasting of swanky offices. The place comprises mainly of small and medium enterprises. And this is where one met Divya Keshav, in her early 30s and now heading Krishna Printernational. Her firm is engaged in manufacturing self-adhesive labels for the pharmaceutical, airline, and consumer durables industries with estimated revenue of Rs 2 crore. Divya’s journey started in 2008, when she took over the mantle to prevent closure of her father’s company, which had been in business for 36 years. Elder of the two sisters, Divya, a Delhi University graduate, who was working with Indiamart Intermesh Ltd, a b2b online company in India promoting the small-scale sector, decided to take stock of the business. The intent was not to let go of her father’s identity – the company. Divya had to lay off some of the employees and actively hire more. Today, she has more woman employees, a strength, which has grown from two when she took over to 25 today including as machine operators. “In a traditionally male-dominated industry in a company that did not employ a single woman earlier, this was seen as a radical step,” she said. Once employees were in place, the next task before her was to purchase new equipment, attract new clients, build a Web site, renovate the facilities, and above all institute generous benefit policies for the employees. Being an unorganised sector, building a client base was very crucial, she said. 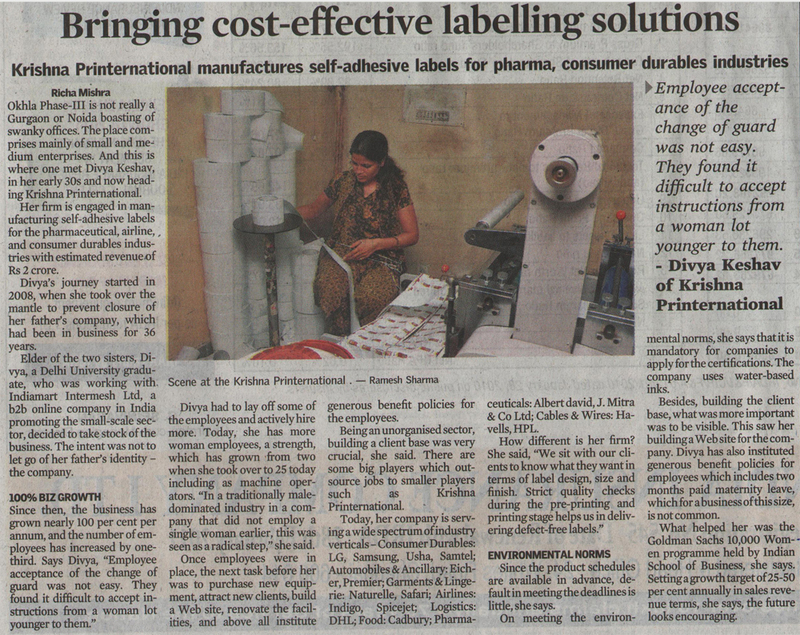 There are some big players which outsource jobs to smaller players such as Krishna Printernational. Today, her company is serving a wide spectrum of industry verticals – Consumer Durables: LG, Samsung, Usha, Samtel; Automobiles & Ancillary: Eicher, Premier; Garments & Lingerie: Naturelle, Safari; Airlines: Indigo, Spicejet; Logistics: DHL; Food: Cadbury; Pharmaceuticals: Albert david, J. Mitra & Co Ltd; Cables & Wires: Havells, HPL. Since the product schedules are available in advance, default in meeting the deadlines is little, she says. On meeting the environmental norms, she says that it is mandatory for companies to apply for the certifications. The company uses water-based inks. Besides, building the client base, what was more important was to be visible. This saw her building a Web site for the company. Divya has also instituted generous benefit policies for employees which includes two months paid maternity leave, which for a business of this size, is not common. What helped her was the Goldman Sachs 10,000 Women programme held by Indian School of Business, she says. Setting a growth target of 25-50 per cent annually in sales revenue terms, she says, the future looks encouraging.